Sophisticated suspense from the mercurial director Steven Soderbergh. Side Effects takes on the subject of Zoloft, Effexor, Prozac and other anti-depression drugs with Emily (Rooney Mara, riveting as a bag of nerves), a WASP narcissist who faults life for not being perfect to her. We care just enough however about Emily that when she greets her husband Martin (Channing Tatum) after four years in prison for insider trading, we’re in hope they can re-patch their once fruitful marriage. Dr. Jonathan Banks (Jude Law, his best performance in a decade) is the compassionate, sympathetic psychiatrist who just happens to prescribe, or peddle, anti-depression drugs a little too heedlessly and is perhaps over-concerned with his latest patient Emily. Scott Z. Burns, who also wrote “Contagion” for director Soderbergh, has fashioned sensationalized elements into a story that plays it everyday real. With the assist of Thomas Newman’s (“The Shawshank Redemption”) foreboding, shivery music score, you know something in this particular world of East Coast grey weather season as presented is off-tune. Our society is addicted to pills, it’s known as a quick-fix remedy to all life problems — as if a popped pill will present an anecdotal rainbow for disaffected people. There is more than a whiff of suggestion to that in Soderbergh’s film. But with Emily, in particular, her depression (the “hopelessness”) is courting acting-out rage. The drugs do run afoul, one can argue without being definitely certain. Comprising the Hitchcockian theme of the wronged man who has to clear his name, Dr. Banks is burdened with a case that challenges his professional ethics. 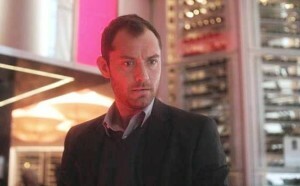 He can be a good man and claim responsibility for Emily’s rage, or he can lie to protect his authoritative reputation but would require to sink Emily permanently. Grown-up legalities are dramatized here. The blame could as well be directed at the newest (fictional) pharmaceutical drug on the market called Ablixa. To tell you who are the good guys and bad guys in a Soderbergh film would be a disservice. They are sympathetically human, adversely inhuman, or diabolically human – but unassuming they all are. 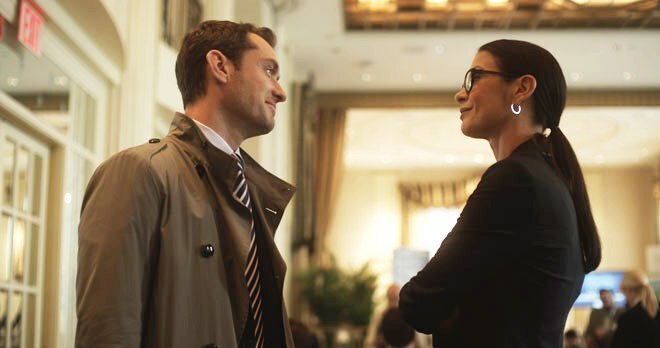 Also in the cast is Catherine Zeta-Jones (“Traffic”) as Emily’s former psychiatrist, Vinessa Shaw (“Big Miracle”) as the short-patience wife to Dr. Banks, Polly Draper as Emily’s equally depression-prone boss, and Michael Nathanson as a District Attorney who would rather not re-open a case following an initial decision. Soderbergh announced he is retiring from motion picture directing to concentrate on stage plays, television, and “other areas.” This still sounds to me like hocus pocus, since his claims of frustration with the industry is not entirely valid – he is generally met with financial success and good to glowing reviews. I would guess he will only take a four year break, or something. In addition, he also confessed that he hates film critics, for vague reasons that I nevertheless understand. He gets blighted when he tries something new. For all the conventions-breaking (see “The Girlfriend Experience,” “Haywire”), sure, he doesn’t get enough recognition. Still, virtually all thoughtful film critics love him and love his movies. For me, he is a maestro of the classical narrative mold that has stood out by tweaking formulas and expectations, and has found a distinctive visual style with color tints that reflect the interior habitat of his characters. 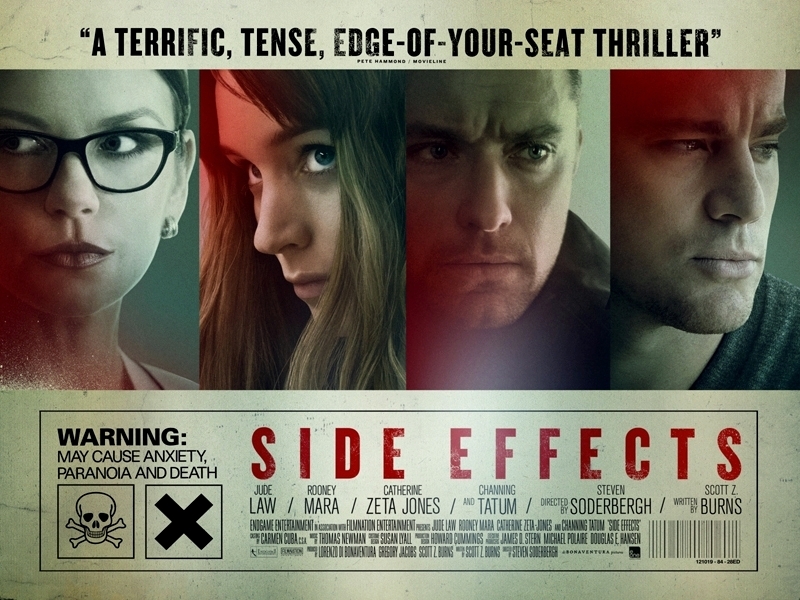 Soderbergh, with “Side Effects” as a prime example, proves he is one of the last filmmakers that makes movies that dare to be for adults. Film Cousins: “Repulsion” (1965); “Limitless” (2011); “Contagion” (2011); “The Girl with the Dragon Tattoo” (2011). Thanks for writing about this film Sean. I’m glad to see another film get rated 4+ stars by you as I tend to agree with you often. So I am adding this to my short list of films that I want to see. I don’t know anymore about this film after reading your write up than I did after seeing the preview however. I say write up because It seems like half of this article was not about the film, but the ins and outs of hollywood meant as commentary for the hollywood community. I’m here to find out about films that you like so I can maybe add them to my list if the subject matter interests me. Please write my level and not a hollywood pro. Saw this film on Friday and found it to be yet another thought-provoking Soderbergh film with a thriller twist. With doctors prescribing meds left and right that are being literally pushed down the throats of patients by the pharmaceutical companies, I think the topic is very timely. It seems to have quiet buzz and I’m hoping more of the public with watch the film and come away with their own thoughts on our drug-happy society.